Kara Tippetts knows the ordinary days of mothering four kids, the joy of watching her children grow…and the devastating reality of stage-IV cancer. 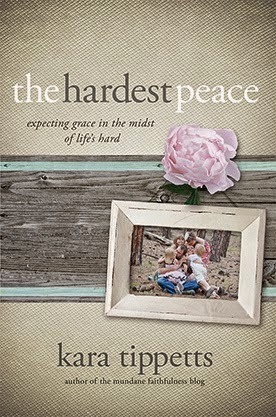 In The Hardest Peace, Kara invites readers to see the grace of the everyday in all seasons of life and to live well even when the living is hard. This book is an invitation to join her in moving away from fear and control and toward peace and grace. Just as the thousands of people who read her blog know, Tippetts explores the hardest questions of life with rare beauty and honesty. Most of all, she draws them back to the God who is present, in the ordinary and the suffering, and shapes every life into the best story of all. Kara Tippetts and her husband, Jason, have four children and are planting a church in Colorado Springs, CO. Cancer is only part of Kara’s story. Her real fight is to truly live while facing a crushing reality. She blogs faithfully at mundanefaithfulness.com. Review: I knew from reading the description that this was a book I wanted to read. I wanted to know her story, her faith, and how she handles hard times. I wondered how I would handle such a situation. Would my faith sustain me? Would God really be enough for me? Kara Tippetts is a brave, faithful, and Good-seeking woman. Her story will draw you in and her dependence on God will intrigue you to keep reading. She humbly describes with honesty the difficulty of her journey with cancer- her brokenness made beautiful through the grace of Jesus Christ. This book is not just for those affected personally by cancer. We all have life situations we struggle to endure. Kara will have you thinking deeply about what is important in this life and how you will choose to live it. I love how she turns to scripture to reveal truth in her life. This is definitely a book you will want to read. Thank you Kara for giving us the privilege to share in your journey. I just recently listened to Kara and her husband, Jason, on the Focus on the Family Daily Broadcast. You can find this broadcast on Living Faithfully with Cancer HERE (Part 1) and HERE (Part 2).